Options such as indoor and outdoor models make GreenKeeper 212 fit a variety of residential applications. It is the perfect tool for fine-tuning an installation or troubleshooting the system. Ideal for residential applications. Toro Tsm-8 8 Station Expansion Module for Tmc-424 Irrigation Series controllers. 1/2" Female NPT. Low battery indicator. Automates watering-saving water and promoting a healthy landscape. Model: 56756. Small orders are no problem. Be sure to add us to yourfavorites list ! Lot# AKH224 C29. This unit has been tested and everything works great except for one zone (#11). That zone does not work but the programs will continue to run after it passes zone 11. Everything else functions perfectly. In good condition with some minor cosmetic blemishes. Untested. Simple-to-use software allows you to program everything at a computer. 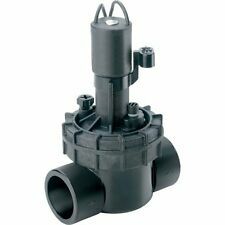 Up to six schedules in "advanced" mode Master valve on/off by zone. Pump start delay from 1 to 60 seconds. Three scheduling choices. Easy to install wireless sensor – no digging or tools required. The Toro Handheld Remote will only work if connected with the Toro Smart Connect Plug-in Receiver. Have a plot plan?. I can design. Have a technical issue?. I can resolve it. Located outside the United States?. This item is new as you can see. God bless. I have four available. They have been in storage for a while and the boxes are a little scuffed and dirty. The Toro Wireless Sol Sensor will only work if connected with the Toro Smart Connect Plug-in Receiver. Have a plot plan?. I can design. Have a technical issue?. I can resolve it. Located outside the United States?. The DDC features an exclusive, patented virtual dial interface that guides a user through simple programming functions. Exclusive, patented “Digital Dial” technology makes scheduling fast and easy. Item Weight. It was working great when I took it out of service. If security tape has been tampered with then sale is final. Toro Lawn Master II 6 Zone Landscape Timer 53806 NEW Little ware on box but never used. It has been tested and is working fine. Brand new in box Toro automatic sprinkler timer. Simple yet sophisticated. The position sets the time and day rain delay lets you postpone watering from 1 to 7 days before automatically resuming. Set watering schedule by day of week. Speciale water-conserving features. Drip watering capability up to 4 hours per Zone. Seasonal adjust says water during cold months. Rain delay lets you postpone watering for 1 to 7 Days. Built-in sensor cord for rain switch or rain sensor. Your choice of day or interval scheduling. Up to four start times program so you can water new plantings often. 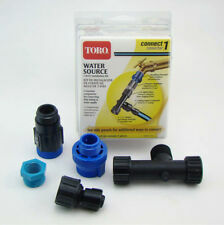 NEW,TORO ( MODEL# 53221, PART#850-74 )RAIN SWITCH, SHUTS OFF SPRINKLERS DURING RAIN, COMPATIBLE WITH ANY SPRINKLER TIMER.CONSERVES WATER AND ENERGY. Although advanced; the Custom Command's hybrid design with a large; easy-to-read display and color-coded; 10-position dial ensures easy programming. Custom Command from Toro - maximum flexibility with ultimate simplicity. Other Product Number: PCB 91-1298. ALL photos. An oversight or lack of knowledge on our part is NOT an attempt to deceive or mislead. Prior authorization is required. We make no claims as to how or if they will work for your application. Efficiently works with new or existing systems. Simple to install and program. It also features a six-zone capacity with port for optional rain sensor. Rain Sensor Port and Sensor Switch: Rain sensor port allows easy connection to a rain sensor with no wire splicing. Used but works. I upgraded so no longer need this. Number of Watering Programs. Features exclusive patented "digital dial" technology that makes scheduling fast and easy! Indoor or utdoor Use. Indoor/Outdoor, Indoor / Outdoor. Seasonal adjust by month saves water in cooler months.